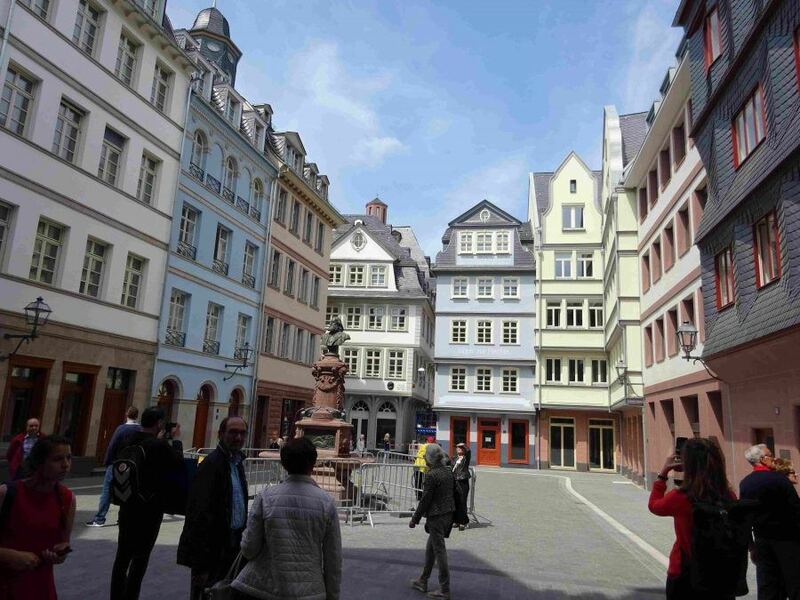 Overlooked by the skyline of skyscrapers, the 7,000 m² ‘new old city’ in Frankfurt is the newest piece of ‘modern architecture’ completed in September 2018. Can one write that? The verbal struggle for the right words, the philosophical discussions about meaning and purpose are manifold. The pragmatically planned town hall extension ‘Technisches Rathaus’ from the late 1960s never met with the approval of the population. 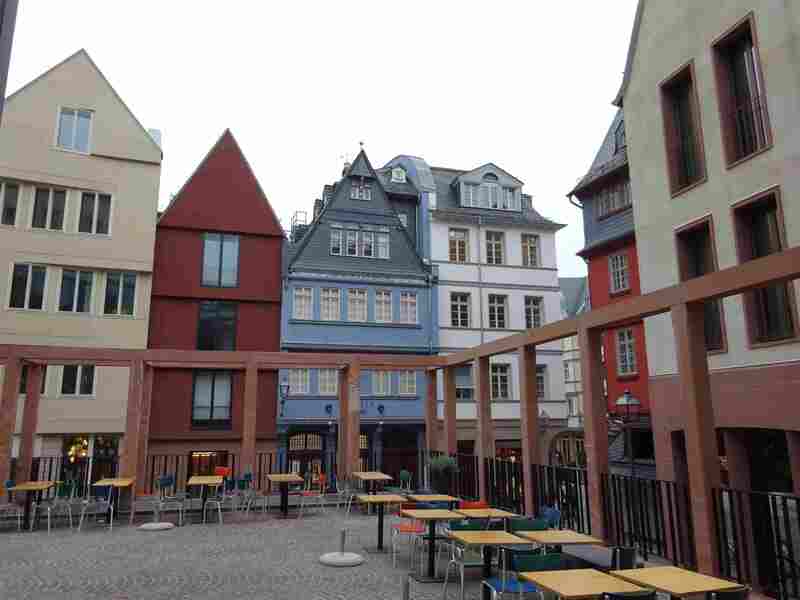 This was the impetus to demolish the building in need of renovation and to let rise in its place a piece of ‘old town’. It consists of 35 buildings; 15 correspond to houses that stood in the same place prior to the destruction of the war, colloquially called reconstructions. The shape of the twenty other buildings was determined in 2011 by a competition that demanded a contemporary exploration of place and history. The spectrum of results goes from a purist design by the architectural office Morger Dettli to projects by Jordi + Keller, which leave one in the dark as to whether one is seeing a newly conceived or a copied facade. 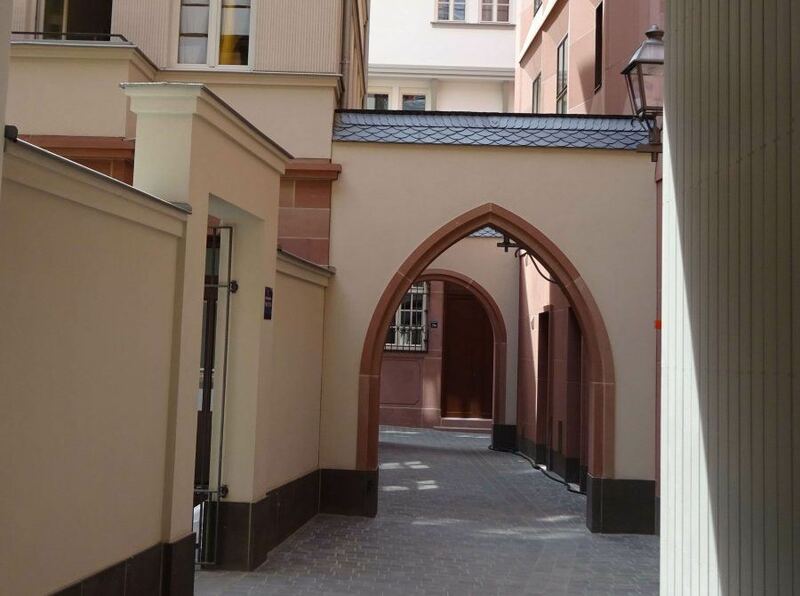 Two of the most striking reconstructions are courtyards where merchants used to live during fairs in the 18th century. The ‘Rote Haus’ (red house) is a 14th-century half-timbered house whose ground floor consists of wooden supports and the ‘Goldene Waage’ (golden libra) is a richly decorated half-timbered house from the Renaissance period. It was built by a wealthy, and at the same time contentious, refugee from Tournai who quarreled with the neighbors over the height and overhang of the house. The reconstructed houses have real timber construction, are insulated inside, have underfloor heating and comply with the ENEV (energy saving regulation), in some respects like old half-timbered houses that have been renovated in a contemporary way. 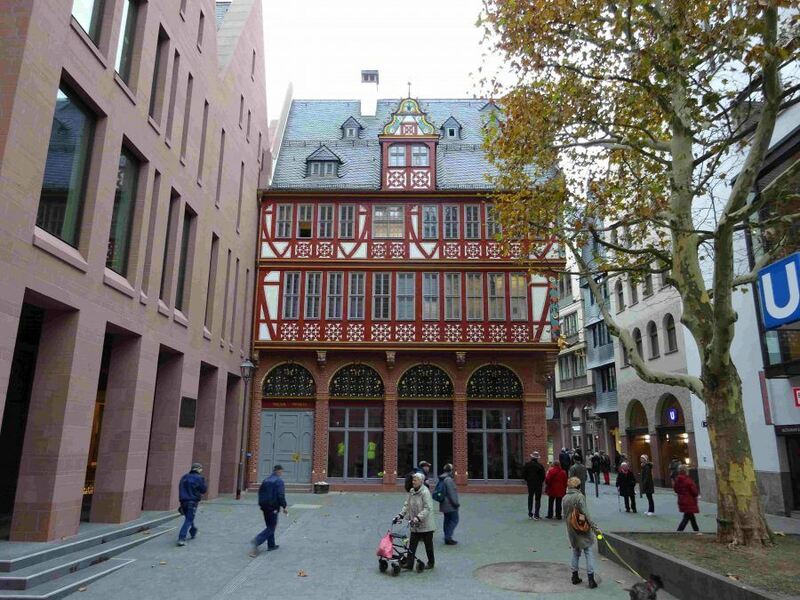 The final section between the old town and the art gallery ‘Kunsthalle’ Schirn (1985) is the town hall (Meurer architects with CBA / Lux). It covers both the foundations of an imperial palace and a Roman bath, with the main hall floating on steel construction. 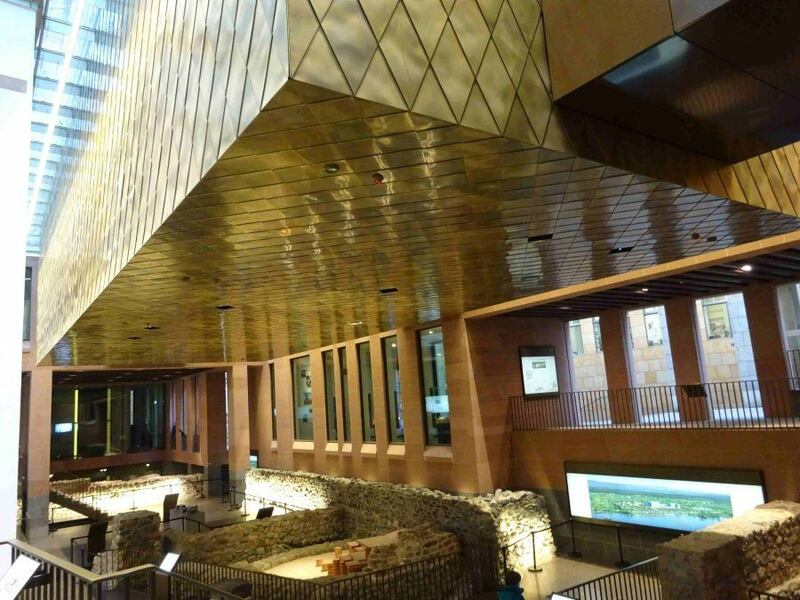 It is clad with brass sheet in a diamond shape, a pattern reminiscent of the traditional apple cider glass and has become the new landmark of Frankfurt’s Old Town. Beyond the discussion in principle, the irrational elements, such as some façades or the narrow streets and passages that run through the new district, are inspiring. Now a playground for many tourists, the neighborhood would also be an ideal playground for children, if they existed here. Rightly, the criticism of Peter Cachola Schmal, the director of the DAM (German Architecture Museum), that instead of the approximately 80 subsidized condominiums, it would have been better to build rental housing for a mixed resident population. Children can only be cheered on during the processions where they reenact the imperial coronations in Frankfurt on the newly-built Coronation Way.